I think I’ve mentioned before that I always provide a freshly baked “something” for my ladies to have with a cuppa at sugarcraft class but it is not often they provide me with food. That is exactly what happened last night! I was given two large, homegrown courgettes (zucchini) with instructions to “Do something with them!”. So when I got home I hit the books and found several recipes for courgette cake and zucchini bread. 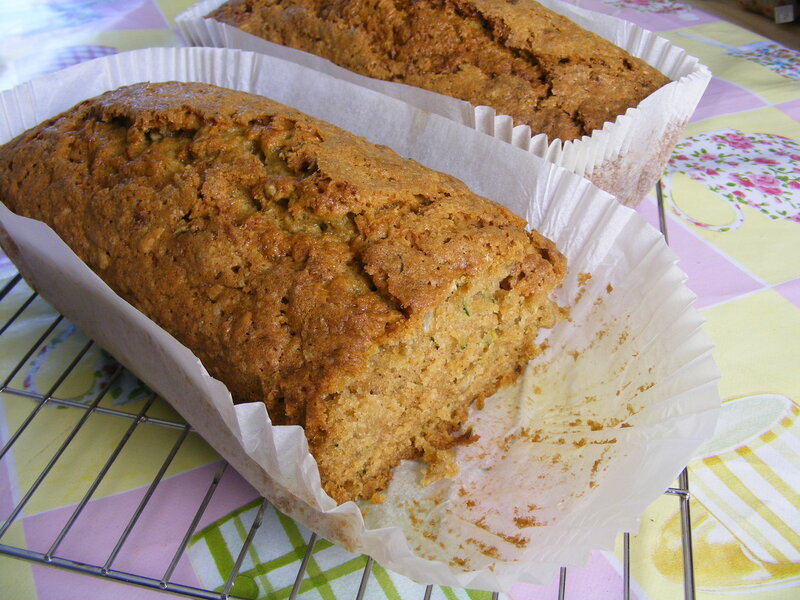 I have tried to make a courgette cake before but I really didn’t like it as I found it quite dense and tasteless. The recipe I settled on was by Rachel Allen, from her book “Bake”. I liked the look of this recipe because it had plenty of spices added to it and reminded me of a good carrot cake but with courgettes instead of carrots. I took the liberty of tinkering with the ingredients slightly to suit my palate and the ingredients I had to hand. Rachel’s recipe calls for walnuts but I substituted them for sunflower seeds as I didn’t have any walnuts in stock. This tea loaf is lovely and moist with the warm, spicy hit of traditional tea loaf. Rachel said her recipe is lovely toasted with a bit of butter and I can safely say I will be trying that in the morning for breakfast. Bake for 1hr – 1hr 15min depending on oven and how evenly you divided the mixture. Allow to cool int he tin for 20-30 min before turning out onto a cooling rack. I like the addition of the sunflower seeds. Will have to give that a try.